Adviser George Homewood recently shared information about the designs for Wahunsenakah Lodge's activity emblems for 2011. The designs honor the six chapters of the Lodge and feature each chapter's totem. 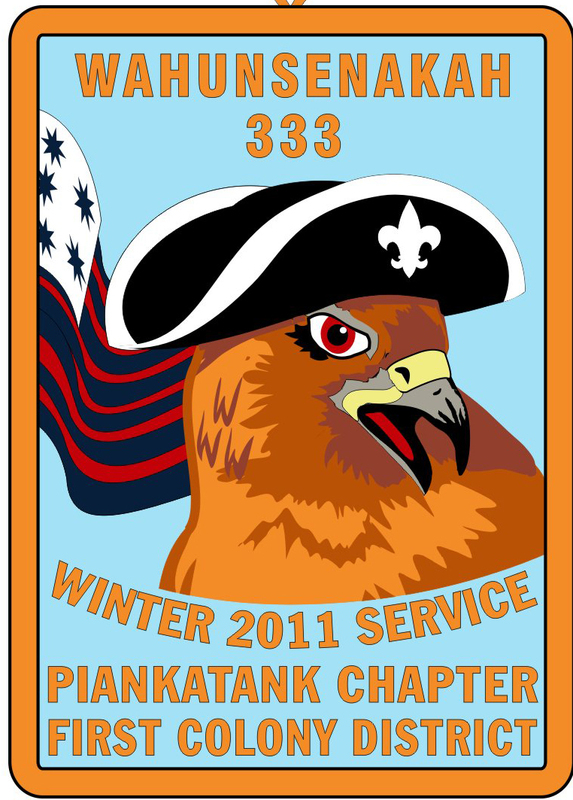 The first event is the 2011 Winter Service Weekend to be held Feb. 25-27 at Bayport Scout Reservation. 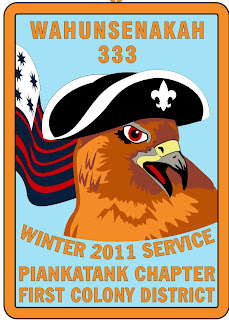 The patch for the event features the red hawk, totem of Piankatank Chapter which serves First Colony District. Notice the clever way the W's have been blended into the cheek feathers of the hawk. I expect to have a picture of the actual emblem soon and you'll find it on the Activity emblems page. 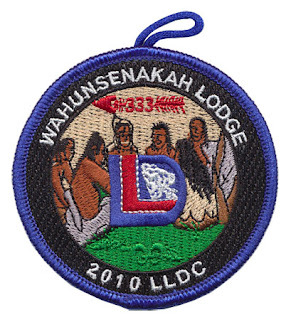 Watch this site for additional sneak peeks at the awesome designs of the Wahunsenakah Lodge activity patches that will be issued during 2011. Larry Johnson sent along a scan of the 2010 Wahunsenakah Lodge Lodge Leadership Development Committee patch. 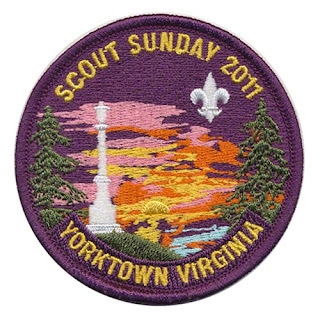 The design is the same as the 2009 issue, except the border color is blue rather than red. The Wahunsenakah 2010 LLDC was held on April 17 at the Yorktown Coast Guard Base, which will host the event again this year. 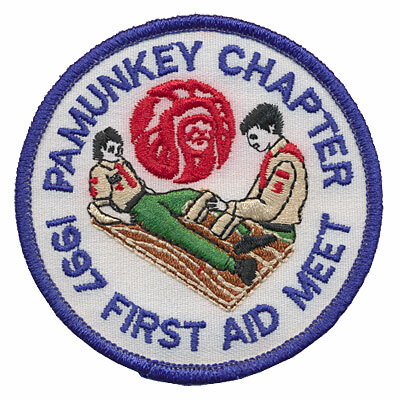 A recent group of eBay auctions by a former member of Kecoughtan and Wahunsenakah Lodge included this unique patch I've never seen nor heard of before. Although it was listed as a Kecoughtan patch the date of 1997 is after Kecoughtan Lodge 463 and Chanco Lodge 483 merged to form Lodge 333, so this is actually an activity patch for Pamunkey Chapter of the new Wahunsenakah Lodge. You will find it listed on the Wahunsenakah Lodge Activity Issues page in the Chapter Activities section. Thanks to Larry Johnson for the picture. 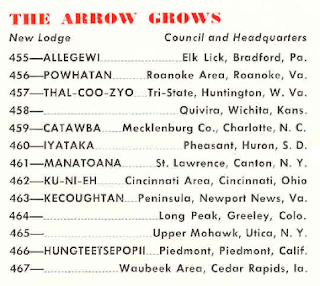 I've been working on a new web site that documents the events attended by Virginia OA Lodges, like Pow Wows, Conclaves, and the like. It's far from complete and I have big plans for expansion to include other content, but I'm finally ready to share the link and encourage you to take a peek when you have a chance! I really hope to make it far more than just a catalog of items issued, and have worked hard to gather relevant information about each event including special guests who attended, election and competition results, and much more. I encourage you to share your memories, pictures, and items like newsletters or meeting notes to help preserve the rich history of the Order of the Arrow in Virginia. Other documents state that Kecoughtan Lodge was originally granted its charter on July 5, 1951, and Powhatan Lodge was first chartered on June 18,1951, so it took the National Office more than a year to report the new Lodges from Virginia. At least they included their names, which is more than can be said for Lodges 458, 464, 465, and 467! Of course, information traveled much slower in those days.